In a message Monday on the social-networking site Twitter, presidential hopeful Amr Moussa called for presidential elections to precede both parliamentary elections and the drafting of the new constitution. 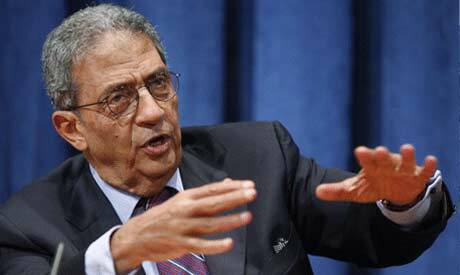 Fearing presidential elections first, said Moussa, is unfounded after the fall of Mubarak's regime and the principles that guided it. He added that drafting the constitution first is problematic in the country’s current state and at a time when there is much opposition to the idea. He added that the “constitution first” debate should not be a reason for disagreements and tensions between political groups. It is not possible now, he believes, to have the parliamentary elections before the presidential because the political scene is not yet ready and the new parties and groups need time to form and organise. Moussa argues that if a constitutional declaration were to limit the presidential powers and terms and establish the independence of the judiciary (an effective separation of powers) then the president would be able to organise the process and call for electing a committee to draft a new constitution and not amend the first one. The former foreign minister and Arab League chief further believes that since the referendum is conducted only to approve or disapprove the constitution as a whole and does not deal with each article independently, a month or two after the drafting of the first constitution the elected president should call for the formation of another elected committee to reread the first draft of the constitution before the national referendum convenes to discuss and revise each article.